Dezeen promotion: Italian tile manufacturer Ceramica Rondine has released porcelain stone flooring that is designed to look like wooden floorboards. The Greenwood floor and wall tiles feature an uneven weave, veining effects and a light surface texture, to given them the look of natural oak. "The Greenwood collection is one of the finest in La Foresta di Gres – the innovative Ceramica Rondine project in which the beauty and warmth of parquet joins forces with the practical appeal and hardness of ceramics," said the brand. "A brand name that guarantees absolute quality as well as eco-sustainable manufacturing processes: thanks to the La Foresta di Gres project, all the beauty and emotion of wood can be enjoyed without having to cut down any trees," it added. While having the appearance of wood, the flooring features all the technical advantages of porcelain stoneware, such as being easy to clean, resistant to staining and impermeable – making it suitable for areas with heavy foot traffic and high humidity. "A tastefully authentic wood effect, even in the classic sizes of parquet: this is the aim of Ceramica Rondine and Greenwood, a porcelain stoneware collection of matchless quality and style able to satisfy even the most demanding customer," said the brand. The company has designed the Greenwood collection in four different sizes to suit a variety of environments, both for residential and commercial settings, as well as indoor and outdoor locations. 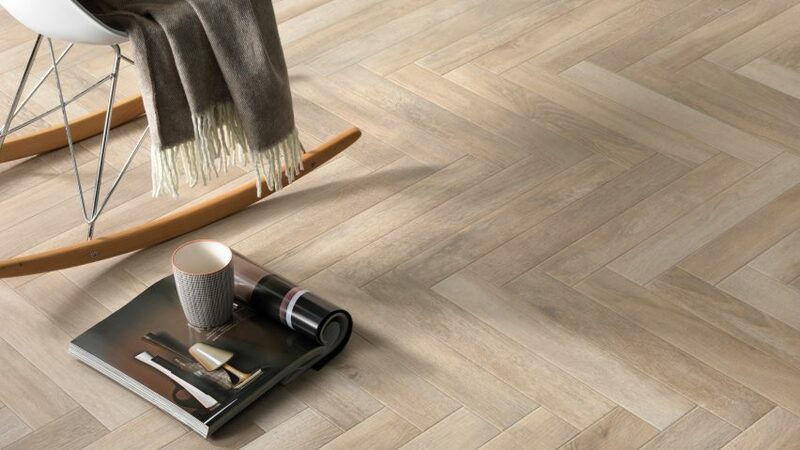 The smallest size, 7.5 by 45 centimetres, can be used to recreate the classic herringbone flooring pattern of traditional parquet, both on floors and walls. The next size up is twice as wide and 61 centimetres in length. "This is a solution able to bring an unquestionable touch of style and greater breadth to any setting," said the brand. "So it is ideal for small spaces to add depth and width." The 24 by 120 centimetres size comes in an indoor style, and a stronger "grip" version. Specifically designed for outdoor areas, this version is frost-proof and able to withstand the elements. The 40 by 120 centimetres size is also designed for outdoor environments, with a thickness of two centimetres to provide a sturdy surface. The thickness matches other products in the H2O range, a loose-lay flooring system for outdoors. This makes the tiles easy to lay on surfaces such as gravel and grass. Each of the four sizes is available in six different colours: white, beige, walnut, brown, black and "greige". According to the company, these "timeless" shades make the Greenwood collection suitable for both country, vintage or shabby-chic interiors, as well as more modern, industrial or minimal design settings. Find out more about Ceramica Rondine's wood-effect tile on the company's website.